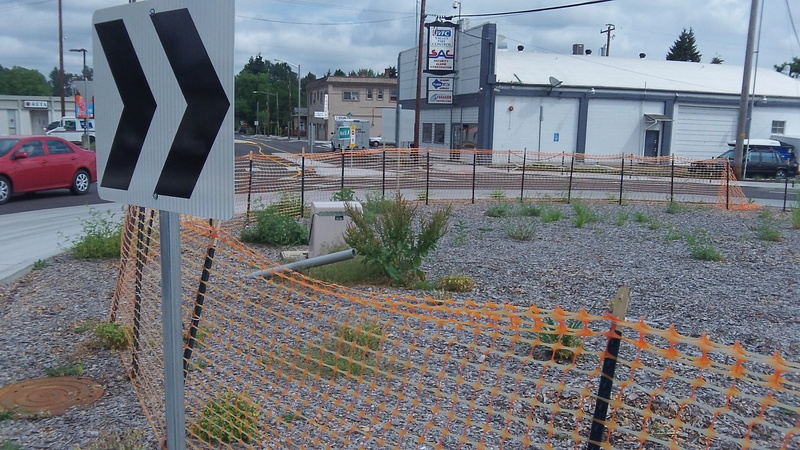 Weeds are sprouting, as weeds will, in the center island of Albany’s Main Street roundabout, where a planned landscaping treatment is taking longer than expected. But let’s be patient; it should be done this summer. It was in February that the advisory board of the downtown urban renewal district, CARA, decided not to spend any money on elaborate decorations for the roundabout island, a treatment that would have cost an estimated $130,000. Instead, it was decided that the island would receive much less expensive, standard landscaping treatment. And it sounded as though that it would be done this spring along with other plantings in the reconstruction area at Main, Salem and Third avenues and Santiam Road. “The project engineer will put the landscaping out to bid on June 2 and will open bids on the 16th,” he reports. 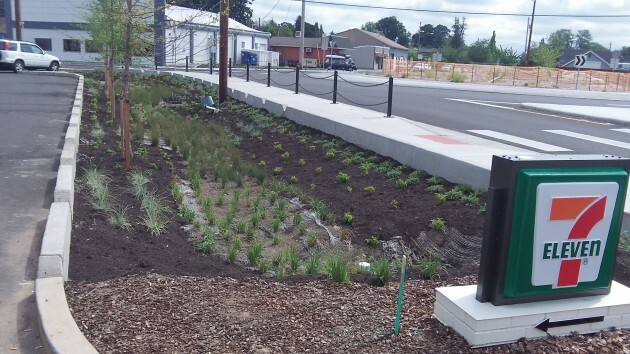 “The work will need to be completed by mid-September.” In the meantime he would see about the weeds..
Swales like this in the Man Street project will collect runoff — when and if the rains resume.